2 of 6 In food processor, pulse graham crackers to form fine crumbs. Add butter and 1 tablespoon of the sugar; pulse to moisten crumbs. Press into bottom and up sides of a 9-inch deep-dish pie plate. 3 of 6 Bake at 350 degrees F for 10 minutes. Remove to a rack; cool completely. 4 of 6 Spread the softened chocolate chip ice cream over the bottom of the cooled crust. Freeze until hardened, about 3 hours. 5 of 6 In a medium-size bowl, mix together the vanilla ice cream, pumpkin and remaining tablespoon of cinnamon sugar. 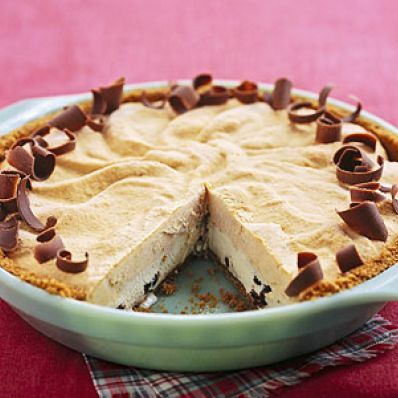 Spread over the top of the frozen chocolate chip layer. Freeze 3 hours or overnight. 6 of 6 To serve, garnish with chocolate curls if desired. If frozen overnight, let stand at room temperature for 15 minutes before serving. Makes 8 servings. Per Serving: 13 g sat. fat, 96 mg chol., 139 mg sodium, 2 g fiber, 381 kcal cal., 5 g pro., 23 g Fat, total, 38 g carb.